Have you ever walked into a place and felt a connection to it? That’s how I felt as I explored the hotel, halls and guest rooms of Petit Ermitage in West Hollywood. True works of art adorn the walls and hallway tables. In fact, the art includes original works by Miro, DeKooning, Erte, Rauschenberg and Dali. I wish I had more photos of this entry hall, lobby, and elevators, as well as of the upstairs hall to share with you. There for lunch and a meeting, I just had to see a room. Only one suite in this magnificent 80 all-suite property was unoccupied, so I took advantage of my opportunity. It was due for a check-in. I walked into the Open Studio Suite and, in some ways, felt more at home than in my own home. Stefan went on to cite the origins of so much of the room. I recall that the rugs are actual hand-woven Turkish carpets from Turkey, but there was much more to the room and I just don’t recall it all. Impressed, I commented to Stefan that I’d traveled the world and saw plenty that I loved — but I didn’t buy the items and take them home. (I’m still not sure how he purchased a city’s gate and brought it to LA.) “From the time I was young, I knew what I wanted to do,” Stephan replied, quite simply. The decor of each room — and the entire Petit Hermitage — is clearly a labor of love and done with an artful eye. 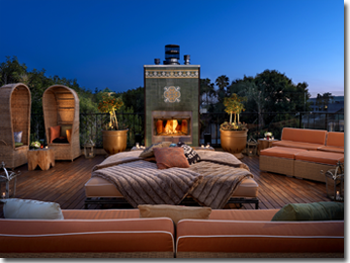 The 80 suites at this West Hollywood gem of a hotel come in four sizes: Demi, Junior, Executive, and One Bedroom/Open Studio All feature a step-down living area. Each suite is unique but shares the same elegance. You’ll find some of that beautiful gate-turned-railing in every suite. You’ll also find a fireplace, a desk, a couch that pulls out to be a bed, and free wi-fi. Plus a 32″ flat screen TV, and iHome Alarm Clock/iPod speaker. On the VIP floor, rooms are Master’s Quarters. 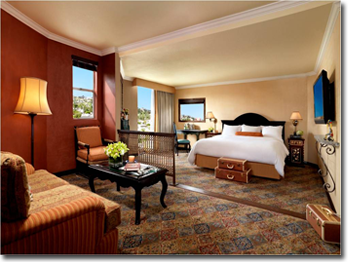 These rooms feature personal butler service, your “Liaison to Happiness.” Guests also receive a complimentary movie.All guests have the option to order and enjoy in-room spa services such as massages, personal fitness including yoga sessions, and makeup services. On top of the hotel, you’ll find the Private Rooftop Club. Completely private, this area an amenity for hotel guests and members only. The pool area sports a wooden deck, rattan chaise lounges with adjustment and cushy cushions. The sections of wall are of a semi-metallic paint/texture, with tiles from ancient Rome and last-century Indonesia. There’s a built-in fireplace as well. This is no ordinary pool, either. It’s a heated salt water pool I’m told is fabulous for the skin. Off to the side are these large flat seats and beautiful fireplace. As you stand anywhere within this rooftop pool area, you’ll likely enjoy the view, which includes the Hollywood Hills. Down a level from the pool deck are spread out sitting or dining areas. There’s a bar here and a restaurant here that offers some very tasty food and the same prices you’d pay if you went looking for a meal in the area. This tranquil setting well removes you from the city, yet provides the opportunity to gaze out and enjoy some of LA’s skyline. These next two photos look down from pool level to the dining level. The hotel’s website has photos that really show off this area! The greenery and flowers that add to the beauty of this area are actually selected to attract hummingbirds and butterflies, adding to the outdoor, un-city retreat, feeling of the hotel and restaurant. The butterfly garden is not just pretty and relaxing. recognized by the National Wildlife Federation! Also, notice how each table provides privacy so you can be alone or be alone with your companion(s). 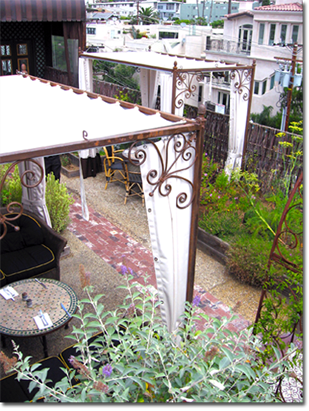 The Butterfly Bar within the hotel building opens up to the outdoor restaurant area — the Hummingbird and Butterfly garden. 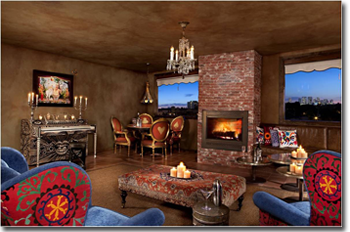 Indoors, en route to the rooftop pool, is the Masters Lounge, a part of the Private Rooftop Club. This room may be rented for private events and accommodates 30 people nicely. 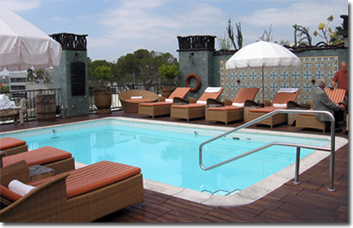 The rooftop pool area — Cabana and Fireplace — can also be rented for a private event. The Butterfly Bar, however, cannot. This is just a block north of Santa Monica Blvd, between N. Doheny Drive and N. La Cienega Blvd. 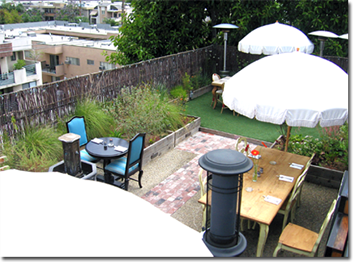 A short walk up to Sunset Blvd and a one-block walk down to Santa Monica Blvd. 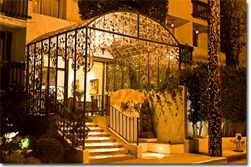 If you’re familiar with West Hollywood and wonder how you’ve missed this gem of a hotel and restaurant, perhaps you knew it under its former name, Hotel Le Petit. After renovation, it was renamed and rebranded on October 1, 2009. It is rated as 4-stars, as $$$ “pricey” on Yelp. need not imagine the whole story. As a one-time traveler and an always-traveller-at-heart, this speaks volumes to me. Having met some of the member hotel principals, I know it is truly felt. Some of the photos I share here were taken by me. Others have been provided by the hotel. Unfortunately, it was not sunny the day I visited, so these photos aren’t as bright as they’d be most days.